Hello! 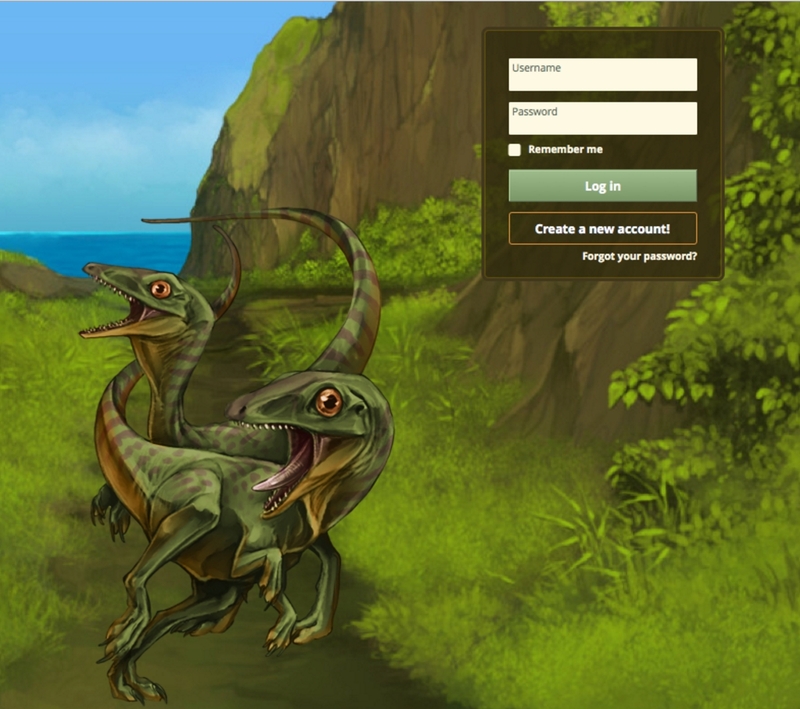 I hope you all had a great April Fools, the Lolosaurus egg has been removed and the new monthly item is up! Since this is the time of year for love this month's item is the Golden Stork! Use this item on a female and her next breeding will produce 8 eggs, allowing you to keep all of them if you have space. There will be no breeding cooldown either! Happy April Fools! I hope none of you get pranked too hard <3! For today 3/31 until 4/1 8pm EX time Lolosaurus eggs will be available in the scale shop! The mystical magical Lolosaurus is a majestic beast for sure, so make sure you get them while you can! p.s. If you want to you can put what you would like to see for April's donation item in the comments or PM me! Hello Exhibitians! I've just got an awesome sneak peek of EXII from Kitty and I get to share it with you all <3! 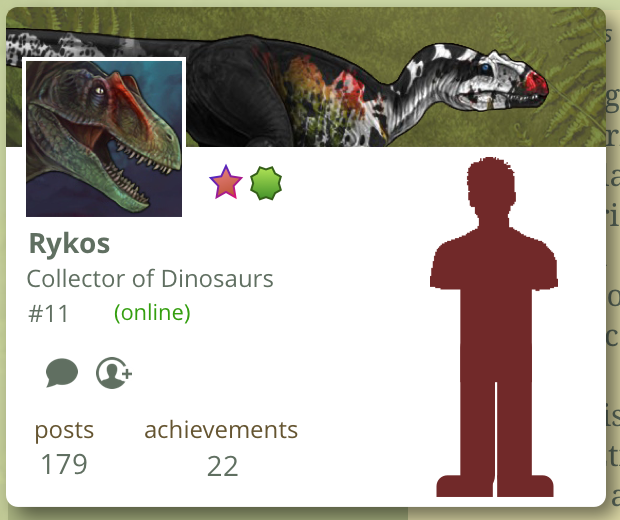 This is an example of â€œplayer cardsâ€ when you hover over player names for example, this will pop up, you can set the background, your favourite dino to appear, and other random stuff And hopefully itâ€™ll be possible to link your player code outside of the game too! 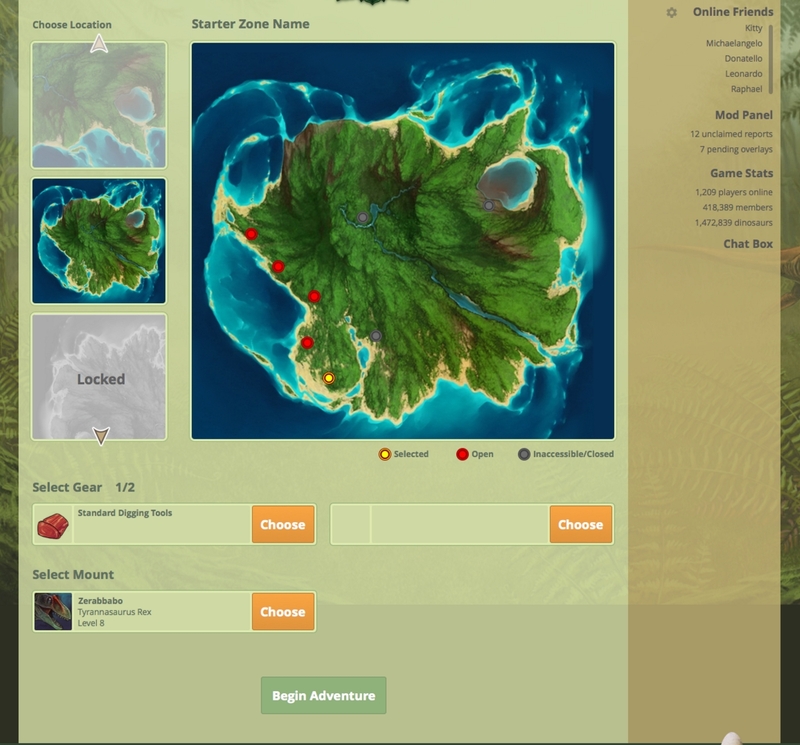 The human like image is currently the placeholder for human avatars! They haven't been drawn yet though so i don't have a sneak peek of that for you guys yet <3! 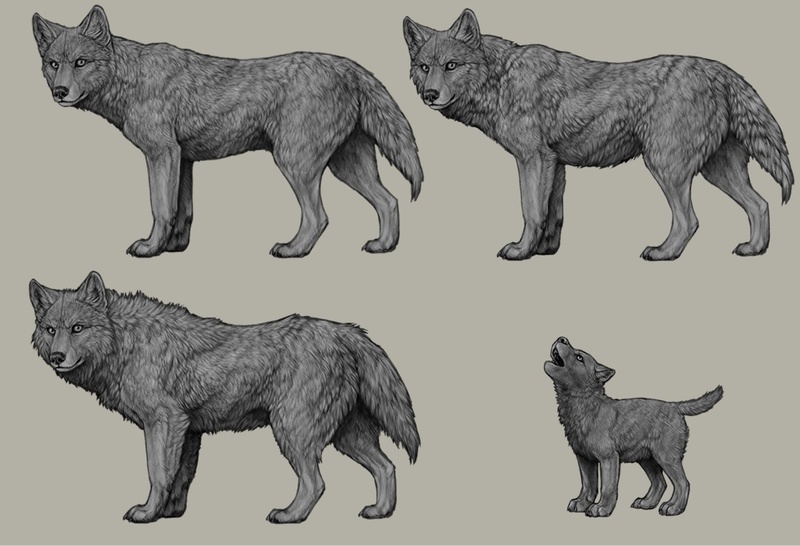 You can also see sneak peaks of the animals we will have on EXII on Xylax's twitch stream http://www.twitch.tv/xylax/v/36035931! Be warned though it may contain some swearing so view at your own risk. This month's new monthly item is super grain! This item when used on a herd of herbies will increase their grade by one grade, so get it while it lasts! The Valentines results are in! Congratulations to the winners of this years valentines event! The first place winner will receive a Golden Stork and a Glowing Yellow Rose! The runners up will receive a Glowing Yellow Rose! 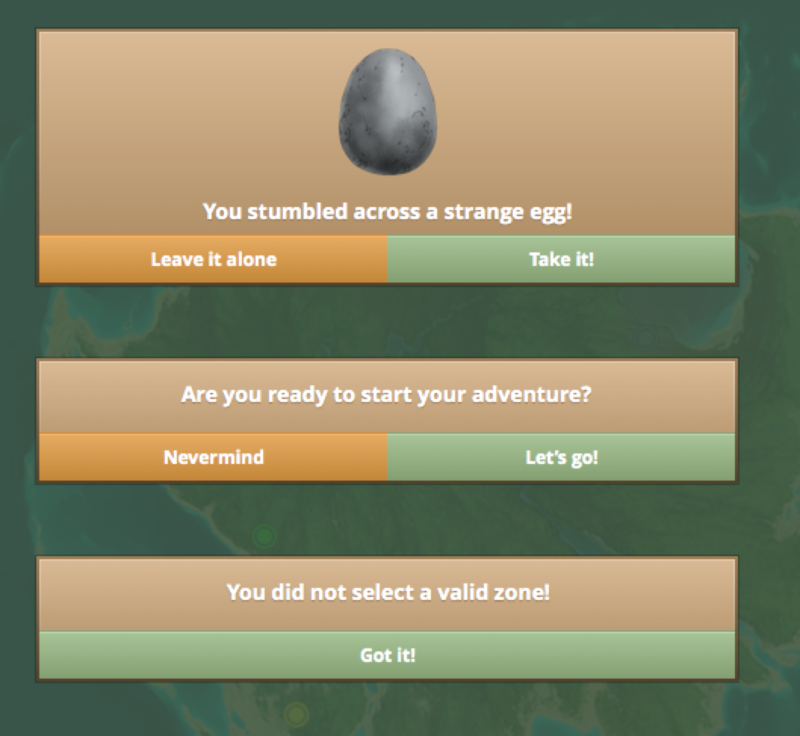 1) Shadowlight (#25257) with 888 eggs! 2) Aresia (#12714) 2nd 791 eggs! 3) tt (#86) with 710 eggs! 4) Phayne (#112) with 609 eggs! 5) Jylani Amplex (#9064) with 461 eggs! Just letting you guys know the monthly item has been changed to the Terror Egg! Which'll turn your dino into a Terror Bird (aka Phorusrhacos) right quick! Also I just tossed a pile of neat goodies at Sammei for prizes for raffles and competitions, so everyone keep an eye on her for a chance to get some rare items! 1) Jylani Amplex (#9064) with 426 snowballs thrown! 2) Kingston (#35864) with 389 snowballs thrown! 3) The Grox (#160) with 377 snowballs thrown! 4) ðŸ¾NewWorld (NÃ¤tive)ðŸ¾ (#31648) with 368 snowballs thrown! 5) Wulfraptor (#170) with 337 snowballs thrown! Hello everyone! Just your friendly neighborhood bug squasher here. As a lot of you noticed, there were some issues over the past few days with the site. These stemmed from us moving the site to a new server. I gave everyone that has logged on in the past few days the items from the 2nd and 3rd Advent calendar days, since they were broken at the time. 1) Shadowlight (#25257) with 100 infections! 2) Abraxyz (Nyx) (#6118) with 84 infections! 3) Pegasus (#3082) with 75 infections! 4) Jylani Amplex (#9064) with 67 infections! 5) Wulfraptor (#170) with 62 infections! Again, I am deeply sorry for the long lasting lack of sign of life from the staff here on Exhibited. There is no excuse for it, so I shall not waste time to give excuses and what not. But, I am here to tell you that you are not forgotten, and you have most certainly not been abandoned. Kitty is working as hard as she can, but life has come a bit in the way. Last year she went through a rough pregnancy, and became a mum! Which naturally has made things go a bit slower than what she'd anticipated. BUT! She has Rykos on board with her, helping her coding new Ex, and they are making huge progresses! Now. Along side working on Ex2, she is also been programming on my site along with Lioden. But my site is near completion now and once that's completely out of the way she will focus entirely on Ex2 rather than dividing her time like now. It's a lot of balls in the air for everyone involved but things are starting to come together now! We are all very excited.